With kind permission from Routenplaner24. At the Neufahrn motorway junction, continue on the A92 towards Stuttgart/Munich. At the Feldmoching motorway junction, take the A99 towards the A8 Stuttgart, approx. 10-15 km. At the München-West motorway junction, take the A8 towards München Obermenzing. At the end of the motorway at the first set of traffic lights, take a right into Pippinger Straße. Continue on this street for about 1500 meters. Before the S-Bahn (suburban train) underground passage, take a left into Theodor-Storm-Straße. After about 500 meters, take a right into August-Exter-Straße. 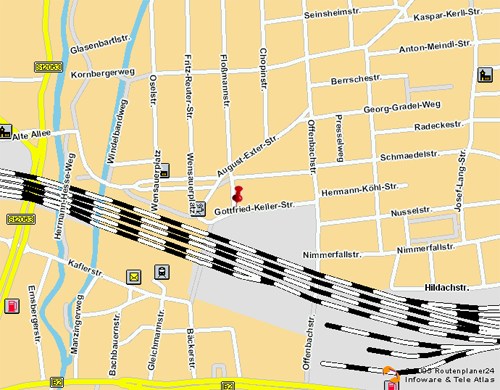 Continue on past the Pasing train station and you have reached Gottfried-Keller-Straße! 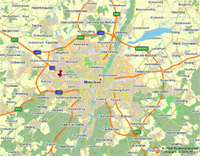 At the Neufahrn motorway junction, take the A92 towards Stuttgart (A8). At the Feldmoching motorway junction, take the A99 towards A8 Stuttgart, approx. 10-15 km. At the end of the motorway at the first set of traffic lights, take a right into Pippinger Straße. Continue on this street for about 1500 meters. Before the S-Bahn (suburban train) underground passage, take a left into Theodor-Storm-Straße. At the motorway exit for Gräfelfing, leave the motorway. Turn left into Pasinger Straße towards Pasing. After about 1 km, the street name changes to Planegger Straße. At a large intersection with traffic lights, bear left at the traffic island and stay on Planegger Straße. At Pasinger Marienplatz, turn right into Landsberger Straße. After about 500 m, turn left into Offenbachstraße. Continue under the S-Bahn (surburban train) bridge. Take the second left into Peter-Vischer-Straße. At the end of this street, turn right briefly and then left into August-Exter-Straße. At the Kreuzhof motorway junction, leave Fürstenrieder Straße and head towards A96 Lindau. Follow the signs for the A96 Lindau. On the motorway, continue towards Lindau until you come to the motorway exit for Gräfelfing. 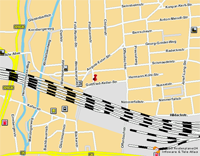 Leave the motorway and turn left into Pasinger Straße towards Pasing. After about 1 km, the street name changes to Planegger Straße. At a large intersection with traffic lights, bear left at the traffic island and stay on Planegger Straße. At Pasinger Marienplatz, turn right into Landsberger Straße. Take the second left into Peter-Vischer-Straße.At the end of this street, turn right briefly and then left into August-Exter-Straße. At the Brunnthal motorway junction and then later at the München Süd motorway junction, travel towards A96 Lindau. At Mittlere Ring in Munich, follow the signs for the A96 Lindau. On the motorway, head towards Lindau. At the München-Ost motorway junction, take the A99 motorway bypass, head towards A9 Nürnberg and keep following the signs for the A9 Nürnberg. At the München Nord motorway exit, take the A99 towards Stuttgart, approx. 10-15 km. In the airport terminal, take the S8 train towards Geltendorf until you reach Pasing, then leave the platform via the North exit (“Ausgang Nord” – this is the exit with the stairs). Turn right, go past the phone booth and you have reached Gottfried-Keller-Straße! At Pasing station, leave the platform via the North exit (“Ausgang Nord” – this is the exit with the stairs).